Dave Frecklington considered it was two points dropped for Matlock but was still pleased as the injury ravaged Gladiators extended their unbeaten run to five matches in the derby in Derby at the Don Amott Arena on Tuesday night. Sports finished the game with ten men after former Town goalkeeper Lewis King somewhat harshly saw red in the 73rd minute after clashing with Jamie Jackson on the edge of the box. But Matlock, who were the better side for much of the contest, still could not break through a stubborn Mickleover back line led by the experienced former Derby and Barnsley defender Pablo Mills. But there were positives to take from the draw. A second clean sheet in four days and three in four games represents excellent progress after they had been conceding an average of three goals per game earlier. Strangely enough it was the first time that Matlock had left Mickleover without a defeat in a competitive fixture. Most people would have quickly accepted four points out of six from two tricky away matches, it may be that the exertions from the fabulous hard earned win at second in the table Warrington on Saturday had taken a fair chunk of the wind out of the Matlock sails. Injuries continue to blight them, Marcus Marshall breaking down in the warm up and Craig King playing despite feeling unwell. Jackson was hastily summoned from the substitutes’ bench which then contained four present or former academy players in Harry Wood, Billy Whitehead, Ashton Hall and Jordan Pierrepont plus Jordan Lemon. In a tight, shapeless start with the ball spending more time in the air than on the deck, it was twenty minutes before there was a sniff of a chance. Matlock, attacking down the slope won a throw on the right, hurled in by Lee Beevers for Brad Beatson to knock on but King was out swiftly to collect. The visitors had looked the livelier but defences were firmly in command. Mickleover, with former Matlock favourite Ted Cribley donning the number eleven shirt, responded as Nathan Jarman’s effort was charged away for a corner before two minutes later goalkeeper Ross Durrant saved comfortably from the same player. King, looking surprisingly lively considering his ailment, found Jackson on the left who wriggled clear of Jake Scott only for home debutant Reece Ford, on loan from Coventry City, to cut out his cross. Then as the interval loomed, Jake Green hooked a difficult chance wide of the far post from an acute angle. It was no surprise that there was a blank scoresheet at half time and Matlock soon set about drawing first blood. Craig Westcarr released King on the left before meeting King’s centre with a downward header saved low to his left by Lewis King. Then Jackson fed Westcarr who turned swiftly but saw the massed ranks of red shirts block his shot. Then Ford did well to thwart Jackson who cut in menacingly from the left. Mickleover suddenly responded as Ricky Ravenhill failed to meet a Cribley cross, the ball bouncing out beyond Durrant’s back post. Westcarr’s effort was clearly deflected behind off a defender, the referee astonishing the visiting support with the award of a goal kick. Matlock were bossing most of the game but equally they might have fallen behind in the 67th minute when substitute Ollie Roberts’ low shot from the edge of the box beat Durrant but thudded against a post before Jarman skied the loose ball too high. That would not have been the usual course of events for Matlock on this bogy ground. 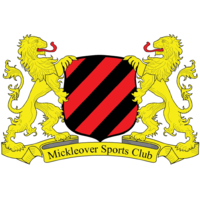 Mickleover would have snatched a goal even if it was against the run of the play. But Frecklington’s troops deserved that moment of good fortune. Jarman took over between the sticks as Lewis King was heading for the shower, Matlock wasting the free kick as Westcarr’s shot was yards over the bar. Mills tangled with Jackson and looked to have tripped him but referee Kenwyn Hughes emphatically refused spot kick appeals. Westcarr placed another free kick tamely into the defensive wall, they really needed to have tested Jarman more. But the forward now custodian was fortunate three minutes from time when his clearance struck Jackson and rebounded goalwards before looping over the bar. It had been that sort of night, lots of endeavour but little quality.